Tired of doing the same thing over and over again in the classroom? Do you feel like you’re doing most of the work in the classroom? Want to make learning more student-centered? If so, Shift This! by Joy Kirr is the book for you. Joy is a collector of ideas. She curates a LiveBinder filled with resources from teachers around the world. Shift This! allows the reader to peek through the window of Joy’s classroom to witness the wisdom she’s amassed. Joy offers thoughtful strategies to improve classroom culture, assign meaningful homework, and implement other shifts sure to make learning fresh and exciting. Her approach is comfortable enough for those who need to slowly test the water yet challenging enough for those ready to dive into the deep end. Her book will help teachers place the student at the center of the classroom. She’ll offer ideas to incorporate social media, host Socratic Seminars, and provide effective feedback in lieu of grades. This is the handbook for teaching in the 21st Century. Why was I spending more time creating rubrics and grading than kids were spending on the assignment? Why did they have to memorize how old each character was in The Outsiders when I couldn’t remember either? I looked forward to the questions opening each chapter. I’ve asked myself these same questions many times. They are so familiar that I often felt the book was a letter written to me from my future self. The book provides many practical bits of help such as web resources and Twitter handles of leading educators to follow. Each chapter concludes with a “Reflection and Call to Action” that serves to promote personal growth but could double as discussion questions for a book study. One shift I look forward to using in my own class next year is the class playlist. I am going to share a Google Sheet with my students to help create a playlist to stream throughout the day. I love to play music, but it’s always been my music. This simple idea will help create a class culture that values every student. Beginning teachers will gain a road map to inspire their emerging pedagogy while veteran teachers will connect with Joy’s critique of worksheet-driven, teacher-centered, traditional instruction. Shift This! 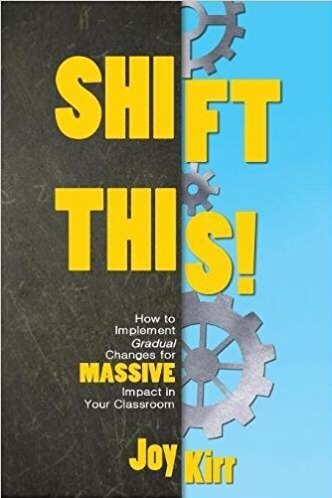 is recommended for any teacher who wants to make “gradual (or major) changes for massive impact” in their classroom.